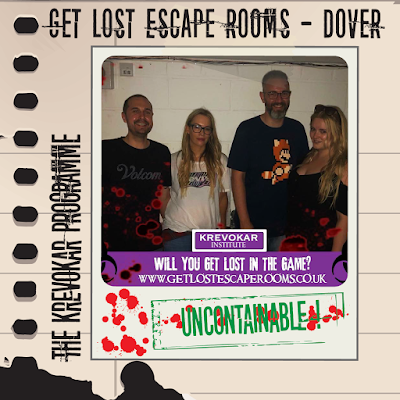 We travelled to the edge of England to visit Get Lost Escape Rooms in Dover, to play their newest room The Krevokar Programme. Greeted by the welcoming Kym - who also doubled up as our games master. Kym invited us to grab a drink in the airy waiting area whilst we exchanged stories of our previous escape adventures. Conversation soon turned into a briefing of the rooms rules and an animated back story into its plot. The Krevokar Programme is set within a world-renowned scientific facility, where the threat of a zombie apocalypse was imminent …and we had just one hour to make our escape! Kym led us to an outside space to access our starting point where our game began. We started on a bit of a slow footing, predominately due to our fatigued ability to locate any initial start point, but with Kyms assistance and our brains eventually kicking-in (we were on our forth room of the day) we were soon on our way, making steady progress. The decor was relatively minimal, but this is no critique. Anything other than sterile white walls and cold, uninviting, clinical surfaces would look out of place within the confines of any reputable lab setting. What we perceived on initial scrutiny to be a relatively small space impressively opened up to become one of the largest rooms we’ve played. The utilisation of the space complimented the progression of the plot and associated puzzles well. The puzzles here were mostly linear, and were a pleasant mix of styles that played well to a cross section of our teams' individual strengths. One particular puzzle on initial inspection looked dauntingly to involve lots of time-consuming information pulling, but actually turned out to be a lot of fun and satisfyingly rewarding to complete. Some of the technological editions were a little temperamental and we did encounter a couple of problems - One with a specific latch that failed to release and later a fiddly element which slightly damped our spirit as we drew closer towards the end - Due to these hiccups we were generously offered a deduction by a few minutes on our escape time. Another minor bugbear was the use of tinny walkie-talkies, although given the rooms vast space we can understand their use as a convenient solution to communicate with teams. However we felt that the use of screens as a form of communication could have been more valuable in a couple of places. There was also no timer countdown to make you aware of your progress (or lack of), an inclusion that we feel positively adds to the time pressure within any escape game. Having said all that there was a number of impressive elements that we could appreciate took some clever implementation and hopefully the initial teething problems mentioned have now been ironed out - After all this room had only been open for a week when we arrived. 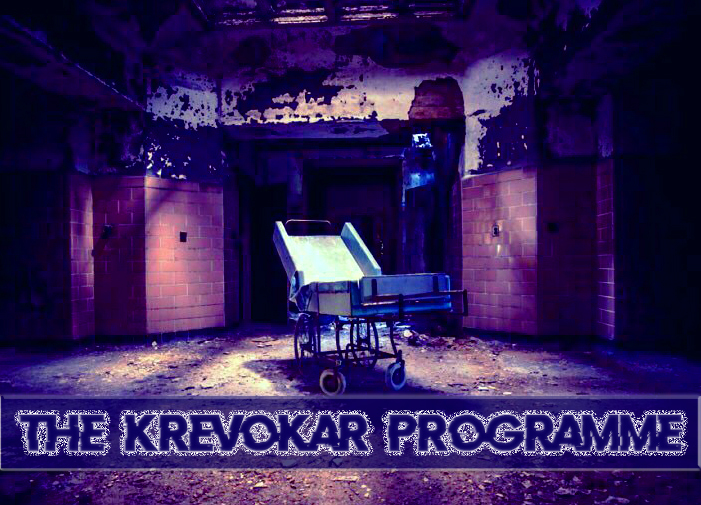 Despite The Krevokar Programme being marketed as a horror escape, we didn’t find it particularly scary at any point - although one aspect of the set was rather intimidating! It's also worth mentioning here that we did play on a generic day. Get Lost Escape Rooms offer regular extreme versions of The Krevokar Programme that promises to amp up its scare factor with the inclusion of live actors. Given the unnerving environments that can be found here, in this format we imagine The Krevokar Programme would translate into a truly excellent horror escape to play. This made the relatively passive (non-extreme) game we experienced a somewhat deflated account of the real deal – in other words this was very much a PG version of its fabulous intended 18 rating. Overall we still enjoyed the room but if we’re honest probably not quite as much as this companies other brilliant escape game: World Fair Hotel. The Krevokar Programme offered a fair assortment of challenging puzzles and if we’d played its extreme version we have no doubt it would have taken this from a three to a five star rating without bating an eyelid. We’d definitely recommend giving it a go, but perhaps opting for it’s Extreme version if your nerves can take playing alongside the terrifying undead.